A Jew from Texas, who knew? For years, I’ve tried to follow the Orthodox Union’s Nach Yomi schedule of reading one chapter per day of the Prophets and Writings, from Joshua through II Chronicles. The full cycle requires two years of daily reading. After the last read-through wrapped up last December, I decided I had to make a change. At a chapter a day, the pace feels agonizingly slow and drained of momentum. To perk things up, I opted to do three chapters per day, plus the Torah reading on Shabbat, and I’ve liked the flow. I’m flying like an eagle rather than plodding like a camel. The Prophets sailed by and the glory and tragedies of the eras of judges and kings became more focused. At this rate, I’ll finish in eight months. Sticking to the schedule requires discipline. Nobody’s tracking my pace, but I know from experience that a few off days disrupts the reading rhythm. After a break, getting back in the swing of things becomes more difficult and I typically skip whatever chapters I missed. I miss vast swaths of chapters. I faced this problem on a recent business trip to Chicago. I left my weighty ArtScroll and Jewish Publication Society Tanachs at home and rolled the dice on finding a certain traditional book in my hotel, the downtown La Quinta. Checking the dresser drawers, I peeked in and . . yes! 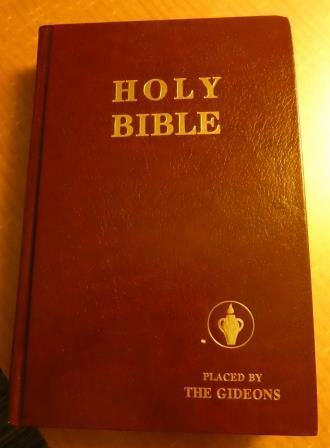 There I found what I expected, a red-covered Bible from the Gideons International. Of course, it had the “Old Testament” ready to meet every aleph and bet of my Nach Yomi requirements, plus the New Testament that no longer figures into my yearly reading cycle. Wait, did I say, “no longer figures”? What’s that about? Some personal background: Despite having two Jewish parents, I grew up attending a Southern Baptist church in Mission, Texas. For those not familiar with this culture, Bible reading and memorization is serious business. Being a studious and God-fearing lad, I took to the Bible-reading schedule I found at the First Baptist Church of Mission with the energy of the innocent.That plan wrapped up the whole Christian Bible with daily readings from the Old and New Testaments. I was so into the idea of sacred reading that my late mother presented me with a leather-covered King James Bible on my 11th birthday in 1968, complete with my name inscribed on the cover. I still have it as a reminder of a phase of my life, and my mother’s sensitivity to an interest that must have seemed a little peculiar in an adolescent (girls, baseball, Top 40 music on KRIO-AM, the Dallas Cowboys, Charlton Heston movies and girls also jostled for my attention in the late ’60s and early ’70s). The men of the Gideons International were part of that boyhood. They visited my elementary school to hand out pocket-sized editions of the New Testament—back when schools allowed that sort of literary promotion. By the time I reached high school, I embraced my Jewishness and stowed away the birthday Bible. In the decades since then I’ve explored lots of Jewish Bibles, from ArtScroll’s monumental Stone Chumash to the JPS translation to the Union for Reform Judaism’s Torah edited by Rabbi W. Gunther Plaut (with an unorthodox but highly readable commentary). I also have Everett Fox’s Torah. Lately, I’ve enjoyed the Gutnick edition used in my local Chabad shul. I read segments of the Prophets and Writings in the weekly Haftorah sections, but I wanted to read the whole megillah, so to speak. Hence, I’m reading Nach Yomi, now at the accelerated schedule. 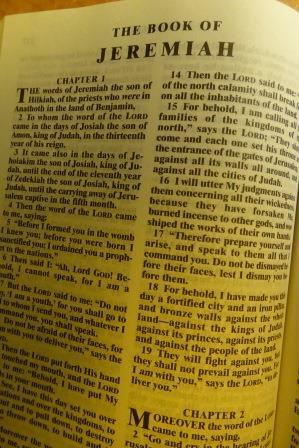 With access to all those Jewish volumes, I never had a reason to venture back to the King James version. Then, in Chicago, I did. The experience felt familiar from 50 years ago and utterly strange as I contrasted the Gideon Bible with my regular resources. No Rashi, no Rambam, no modern commentaries. No Hebrew, no footnotes, no guidance beyond the front of the book, which suggests passages for spiritual uplift and comfort. With the Gideons, I was reading the text straight up with no explanatory chasers. In contrast to Jewish versions, the Gideon Bible treated each verse on its own. Unlike, say, the JTS version, the text did not form paragraphs or poetic forms to create a more visible narrative. The black bold type and translation from the early 1600s gave the text a different feel and weight: dense, verses marching down the columns, meant for the dark night of the soul in a lonely hotel room rather than leisurely study. Other Bibles fill that role. The Gideons want to get the Word out there to the traveling public, not provide deep biblical exegesis. If that’s the goal, they are succeeding and I salute their dedication to their century-old mission. You might say they pulled this Jew’s bacon out of the fire. My two days of reading in Jeremiah passed quietly. After my second day of reading, I flipped ahead to the book of Revelations to skim its apocalyptic visions similar to some parts of Ezekiel, the prophet I’m now reading. The three-chapter beat goes on. While I enjoyed my foray into the Gideon Bible and the memories it evoked, I’m glad to push ahead in ArtScroll and JPS. I’m back from the road and I’m home. Van "Ze'ev" Wallach is a writer in Westchester County, NY. A native of Mission, Texas, he holds an economics degree from Princeton University. His work as a journalist appeared in Advertising Age, the New York Post, Venture, The Journal of Commerce, Newsday, Video Store, the Hollywood Reporter, and the Jewish Daily Forward. A language buff, Van has studied Spanish, Portuguese, Russian, Yiddish and Hebrew, although he can’t speak any of them. He is the author of "A Kosher Dating Odyssey." He is a budding performer at open-mic events.